You know when you stumble upon a blog that sends you down a rabbit hole where the rest of the world disappears? That’s what happened to me when I found Justina Blakeney’s blog. 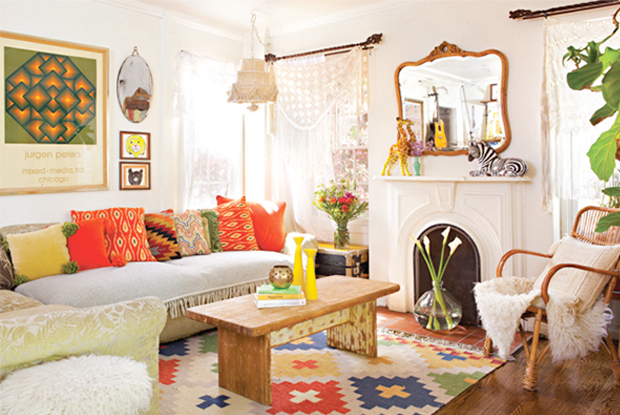 Talk about bohemian, colorful, free-spirited, worldly goodness. One look at any one of the posts on her blog and I just want to move into her world. Justina is a stylist and designer, with a degree in World Arts & Cultures. She is well-respected in the design world by the likes of Elle Decor, Apartment Therapy, Martha Stewart, and many more, and she does things her way- with bohemian flair, with handmade elements, and with the story of an object in mind. Here is a peek at Justina’s Jungalow home….see what I mean?! So you can imagine that I am *quite* honored to be featured on her blog today. Sometimes we find ourselves right where we think we belong…. Thank you Justina!